A few weeks ago Patrick Logue, an Irish Times Motoring journalist, wrote an article about lawless cyclists. The majority of the comments dismiss his rant. He was also mocked in a thread of over 200 posts on the boards.ie Cycling forum. 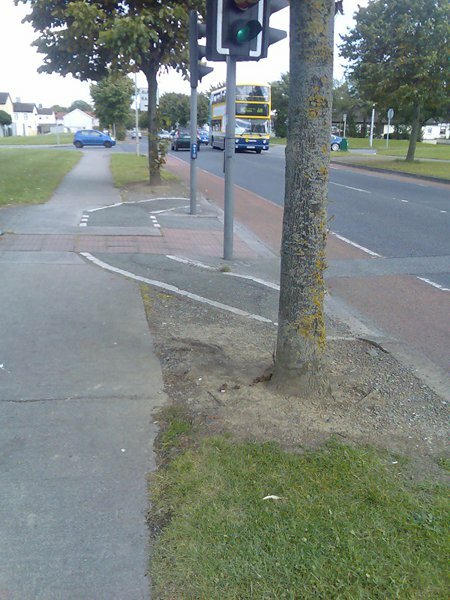 On Mountview Road in Dublin 15, Fingal County Council seem to be facilitating cyclists in breaking red lights. 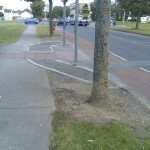 There is a small tiny off-road cycle track that routes cyclists off the on-road cycle track and around the traffic lights at a pedestrian crossing. This would seem to encourage cyclists to use it when the traffic lights are red. Would Mr Logus consider this to be breaking the lights? This off-road cycle track could be construed as missing the required signage, one could argue that the required sign is in fact in place earlier on the on-road cycle track. Either way, I plan to stay on the road.